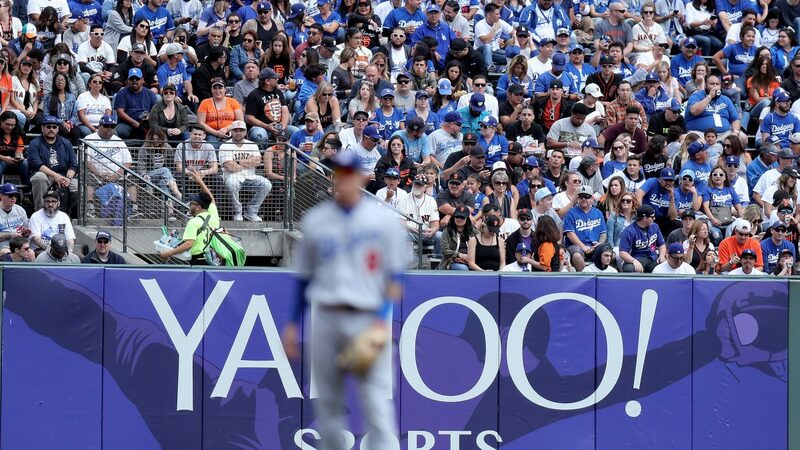 Left-center field was a concentrated sea of blue, and the rest of the stands were only marginally less concentrated with rival fans. 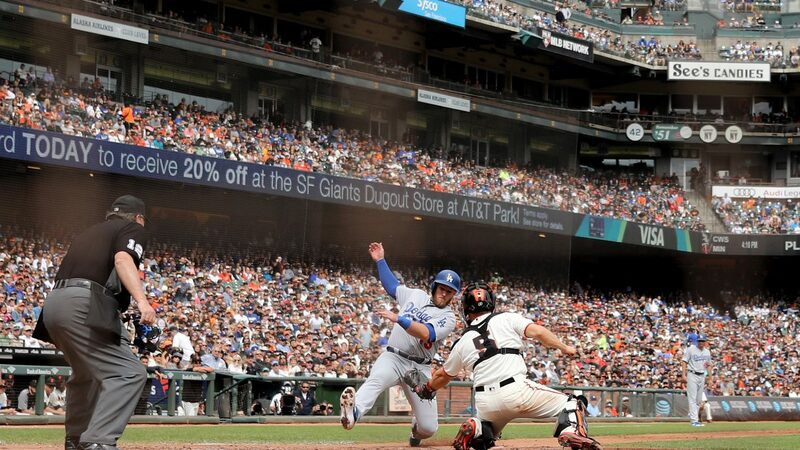 Chants of “Let’s go Dodgers” often drowned out hometown fans’ “Beat LA” mantra. 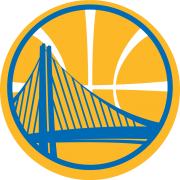 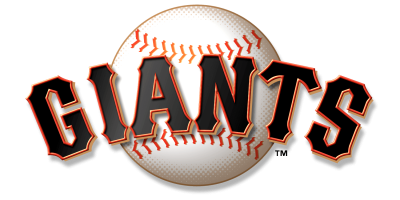 But in the penultimate game of the season, the Giants (73-88) made a game of it for the first time in a while, after going 5-19 coming into Saturday’s matinee. 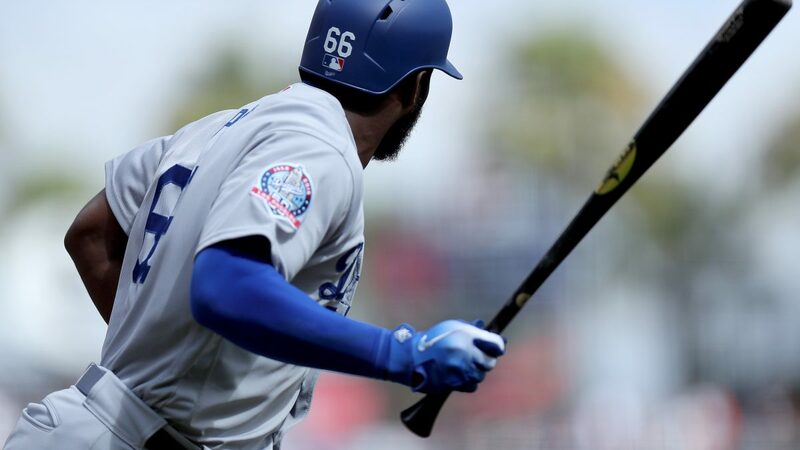 They played a spirited game of ping-pong with the lead against the Dodgers (90-71) through the first eight innings, but things completely fell apart with two outs in the ninth, and the 6-5 deficit left by Mark Melancon (L, 1-4, 3.23 ERA) after the eighth turned into a 10-6 laugher by the time all was said and done. 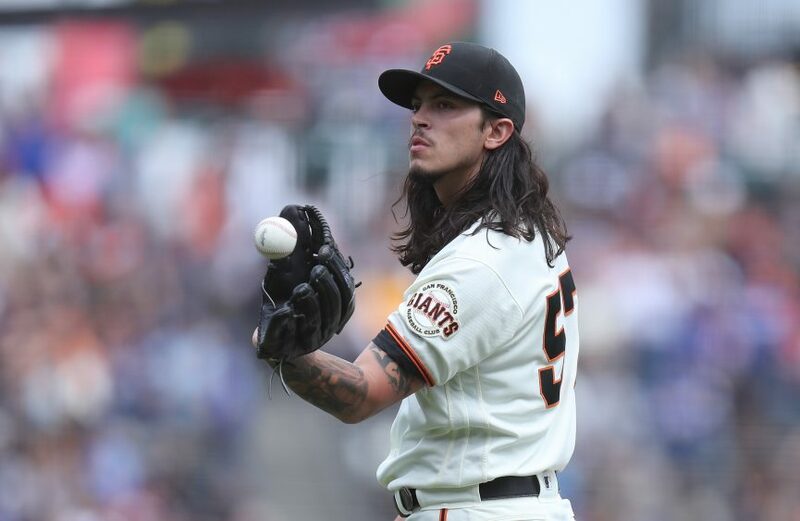 San Francisco Giants starting pitcher Dereck Rodriguez (57) gets the ball back after giving up a home run to Los Angeles Dodgers center fielder Joc Pederson (31) as the Los Angeles Dodgers face the San Francisco Giants at AT&T Park in San Francisco, Calif., on Saturday, September 29, 2018. 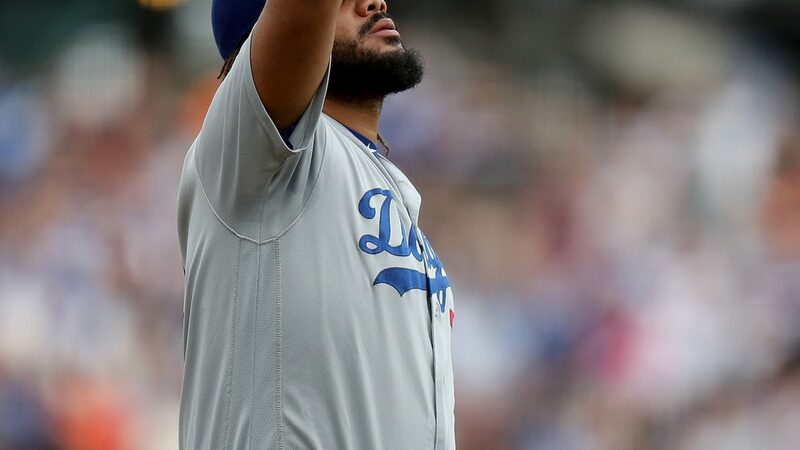 This is the first time in Rodríguez’s pro career that he’s pitched into September, and for his second-straight outing, the extended season looks like it may have caught up with him. 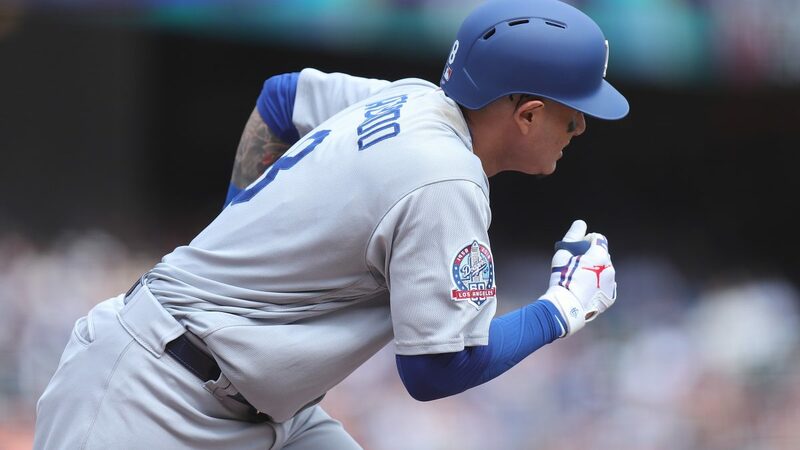 Rodríguez lasted just three innings Saturday, matching a season-high five runs allowed on seven hits, including another season-high two homers. 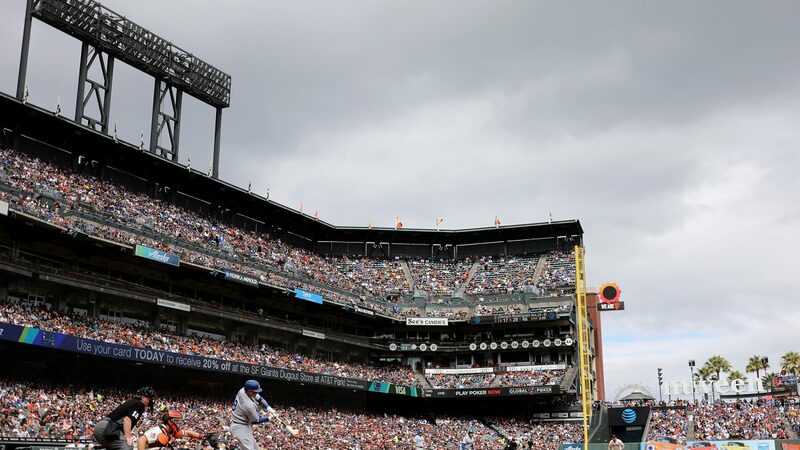 Los Angeles Dodgers starting pitcher Clayton Kershaw (22) throws a pitch in the first inning as the Los Angeles Dodgers face the San Francisco Giants at AT&T Park in San Francisco, Calif., on Saturday, September 29, 2018. 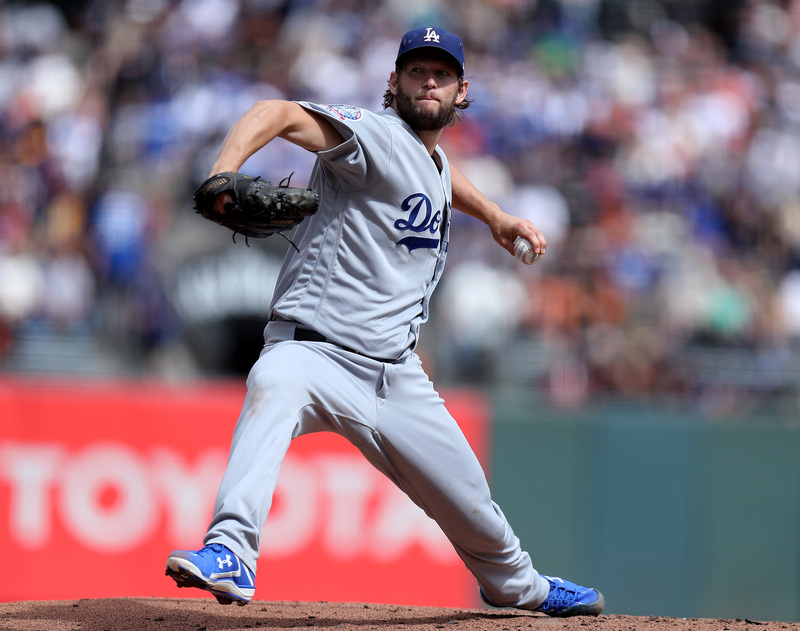 As Bochy noted, Dodgers ace Clayton Kershaw (ND, 9-5, 2.73 ERA) certainly wasn’t at his finest, either. 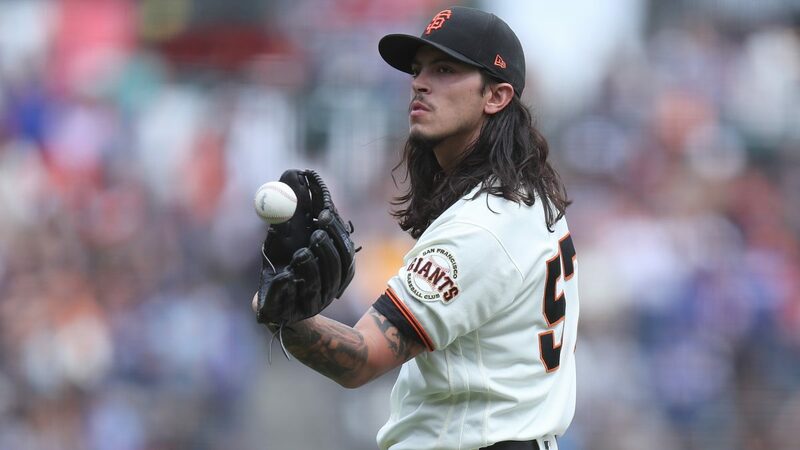 Through five innings he allowed five runs — the most he’s allowed all season, and the most he’s ever allowed to the Giants in his career — on eight hits and was pulled after just 79 pitches. 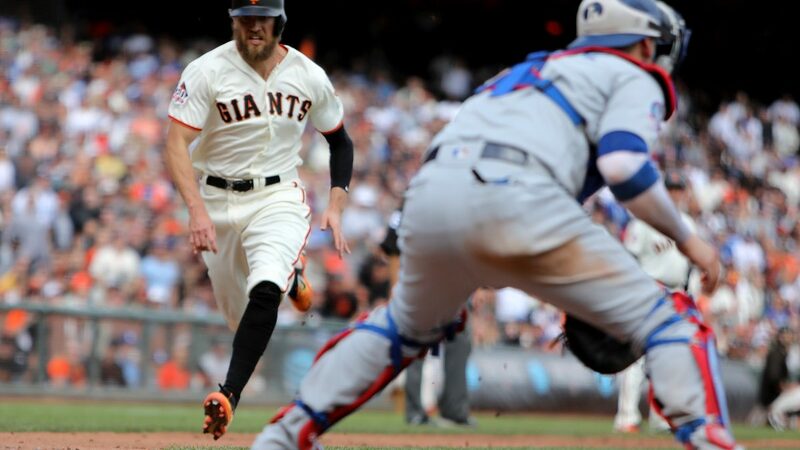 Both teams got offense going early. 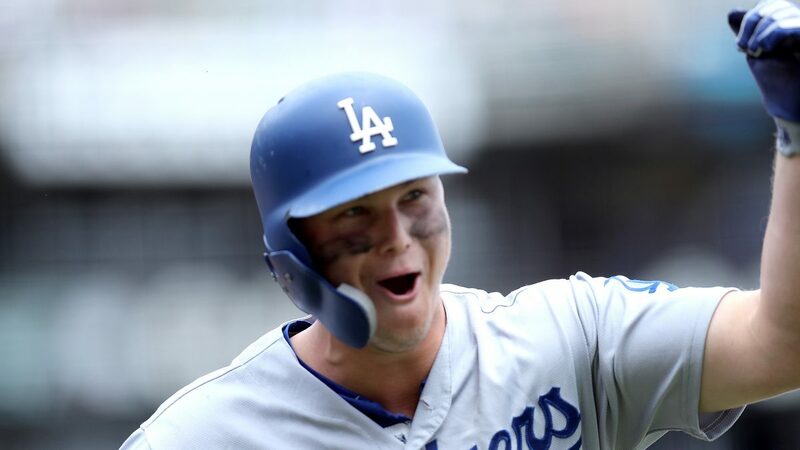 Los Angeles got on the board immediately on a Joc Pederson rainbow over the wall at Levi’s Landing on an up-and-in, 93-mph fastball for his 11th-career lead-off bomb and the eighth of the season, a Dodgers franchise record. 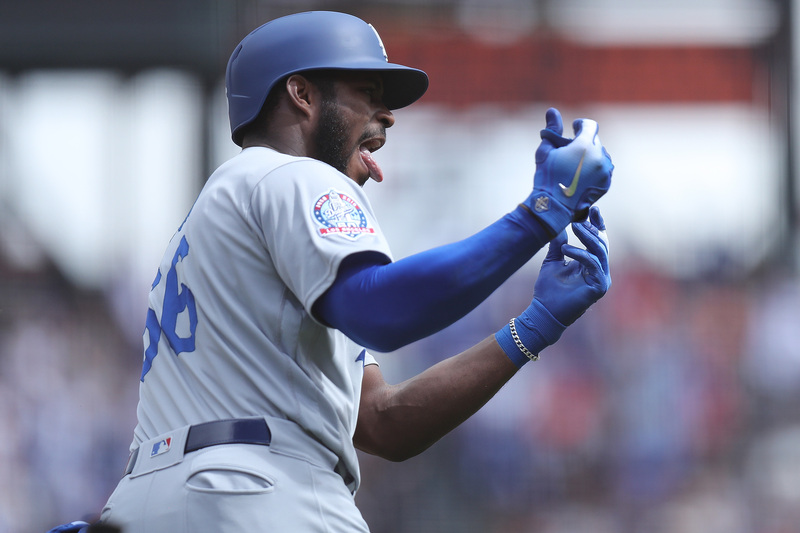 Then, Giants arch-nemesis Yasiel Puig led off the second with a solo shot of his own to put the Dodgers ahead 2-0. 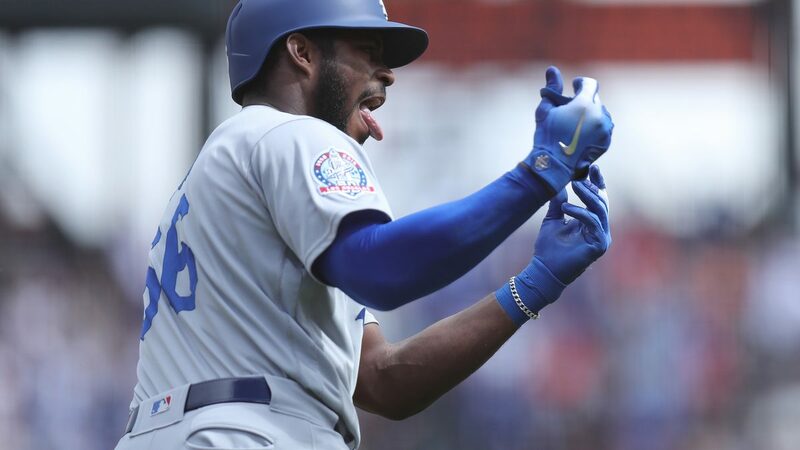 Los Angeles Dodgers right fielder Yasiel Puig (66) points to the dugout after he hit a home run as the Los Angeles Dodgers face the San Francisco Giants at AT&T Park in San Francisco, Calif., on Saturday, September 29, 2018. 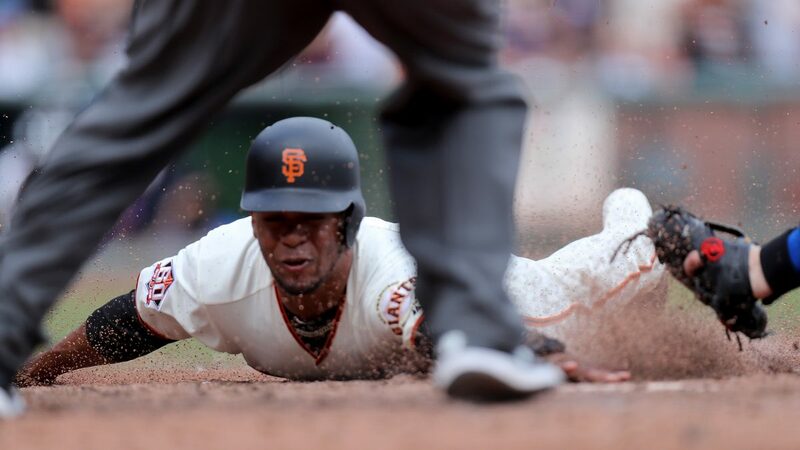 San Francisco’s first successful at-bat with a runner in scoring position came in the home half of the second when Gorkys Hernández lined a two-out single to left field to plate Brandon Crawford from second. 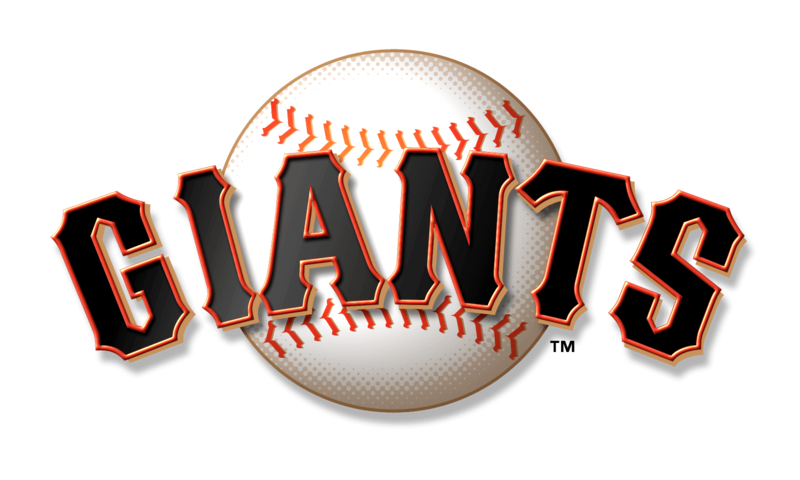 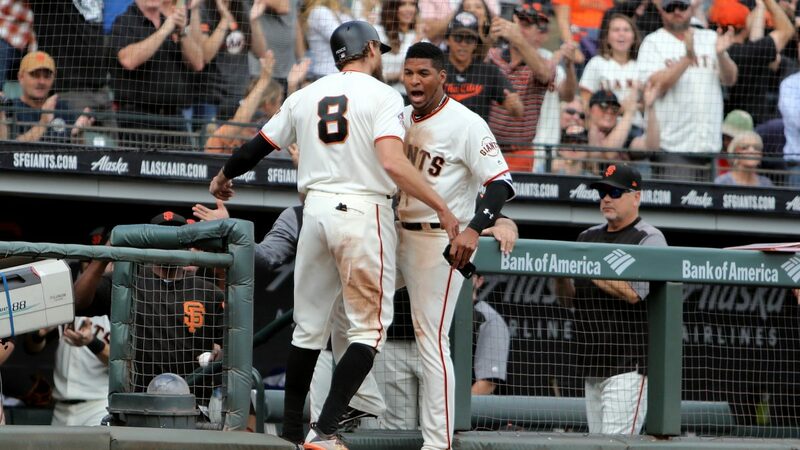 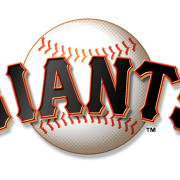 They added on two more in the third when, with runners on second and third, Joe Panik managed another clutch hit, knocking a two-run single to left to give San Francisco a 3-2 lead. 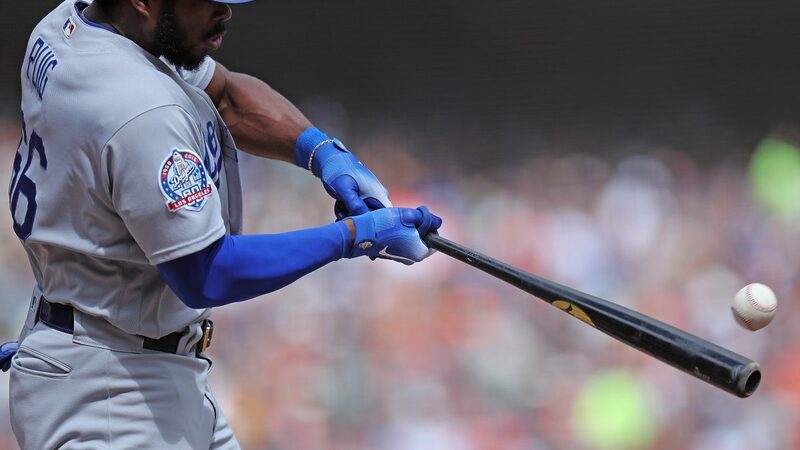 It wouldn’t hold, though, as things fell apart in the fourth. 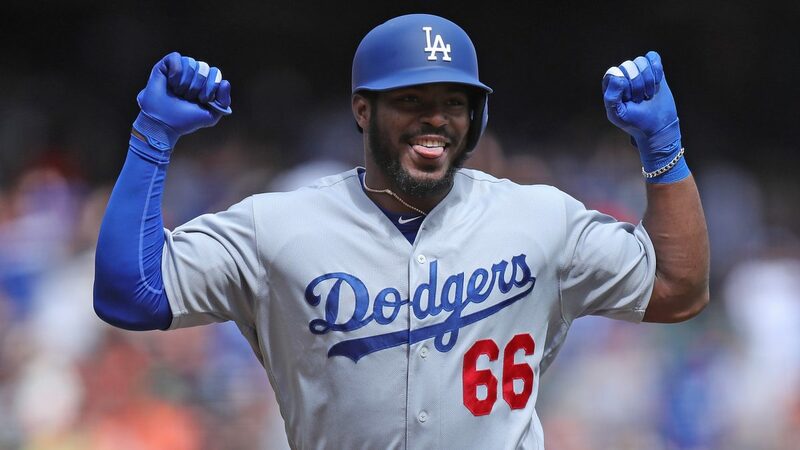 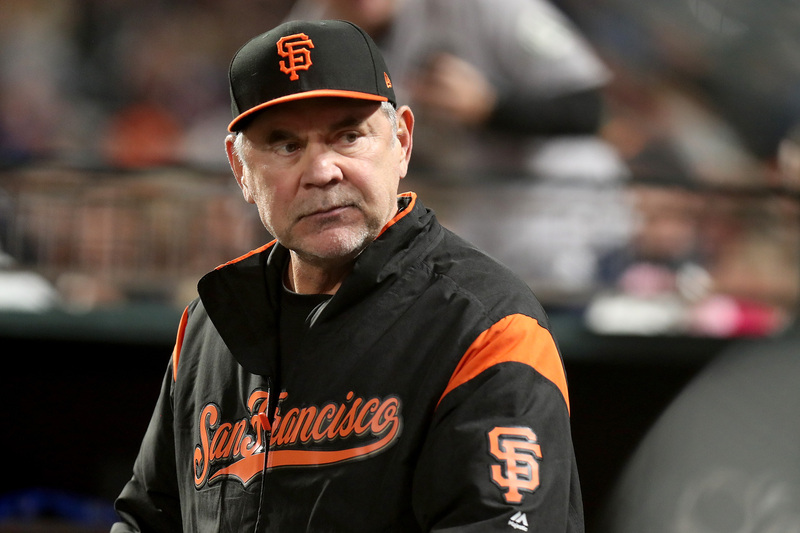 Rodríguez gave up a free pass to Puig to leadoff the inning, a single to Yasmani Grandal, and a two-bagger to Kiké Hernandez, tying it up and prompting Bochy to hook him for Ty Blach at just 69 pitches. 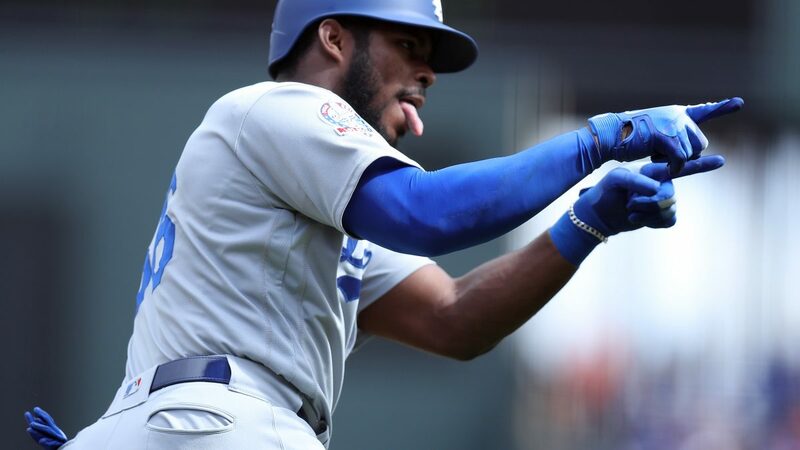 Facing Kershaw, Blach allowed a two-run single to right to give the Dodgers a 5-3 lead, setting Rodríguez up for what seemed like certain loss, based on the Giants recent offensive production, or lack thereof. 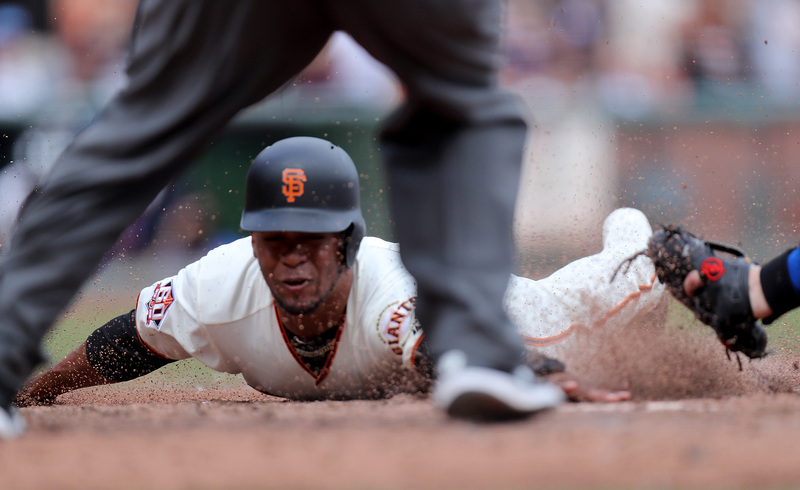 San Francisco Giants pinch hitter Abiatal Avelino (46) scores in the fifth inning as the Los Angeles Dodgers face the San Francisco Giants at AT&T Park in San Francisco, Calif., on Saturday, September 29, 2018. 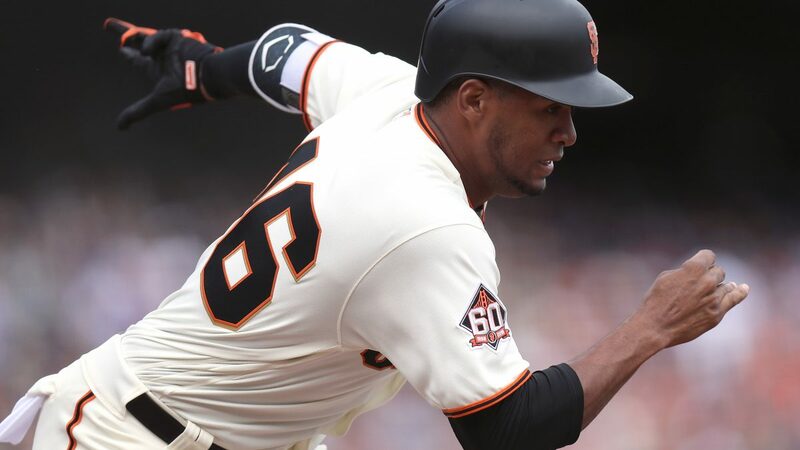 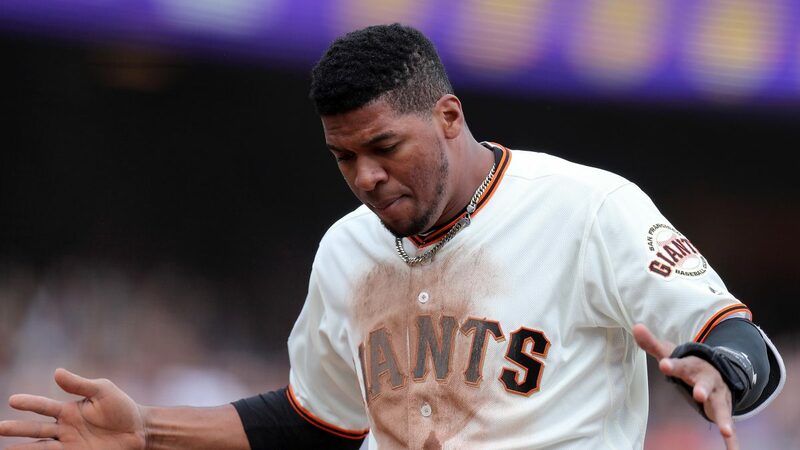 But the very next inning the Giants did Rodríguez a favor, tying it up on a Pence double that scored Abiatal Avelino and a Panik sac fly to spare him an additional loss on his record. 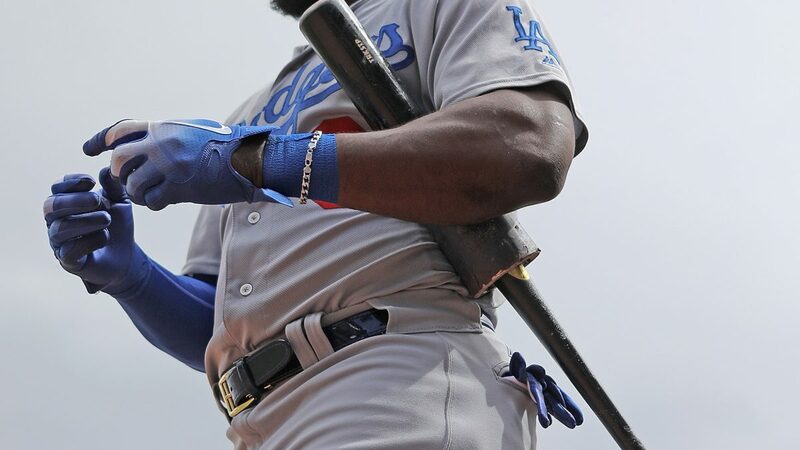 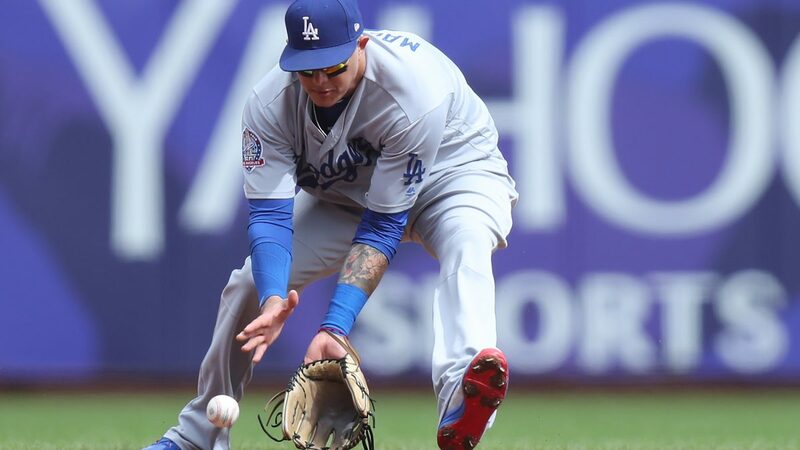 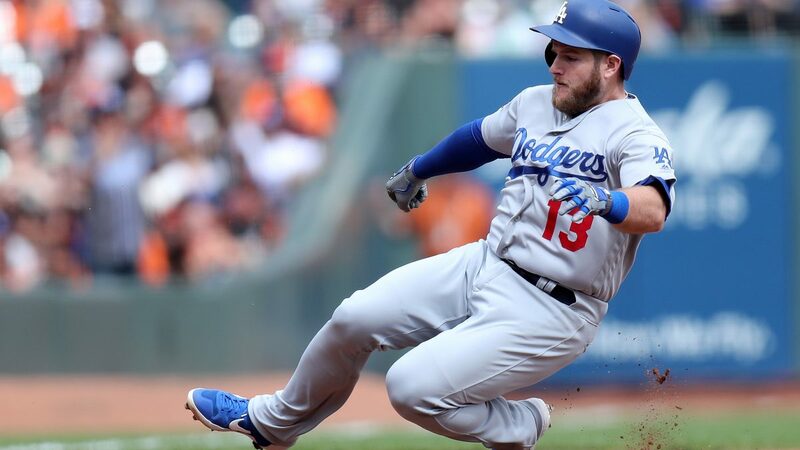 Despite some dramatics, the score remained tied for a couple more innings until Melancon allowed an eighth inning leadoff single to Chris Taylor and a two-out triple off the wall in right field to Manny Machado to give the Dodgers the 6-5 lead. 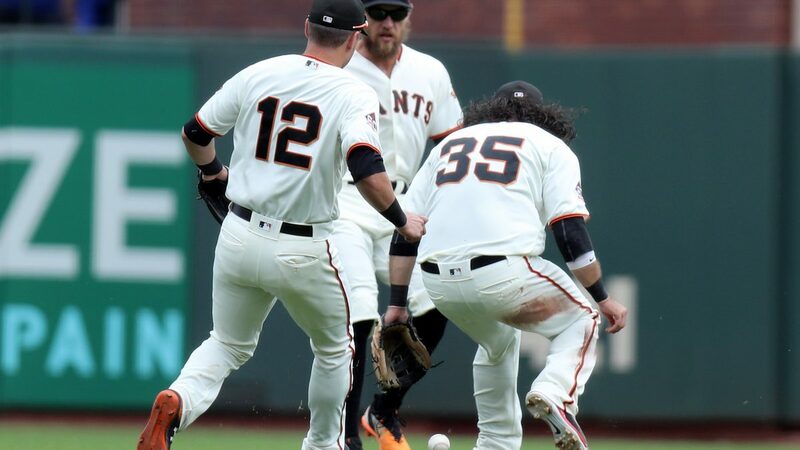 Each team would scratch one more across, but it was about as irrelevant as the 2018 Giants season. 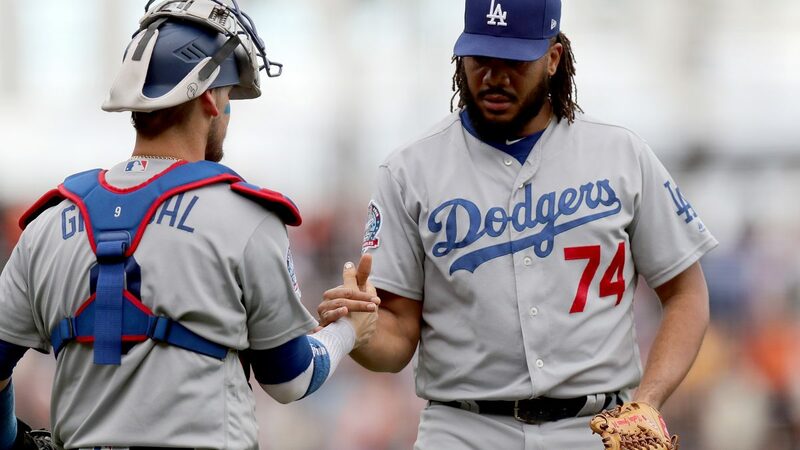 Alex Wood (W, 9-7, 3.68 ERA) took the win, and with it, the Dodgers clinched their first series win at AT&T Park since 2015 and, oh yeah, a 2018 playoff berth. 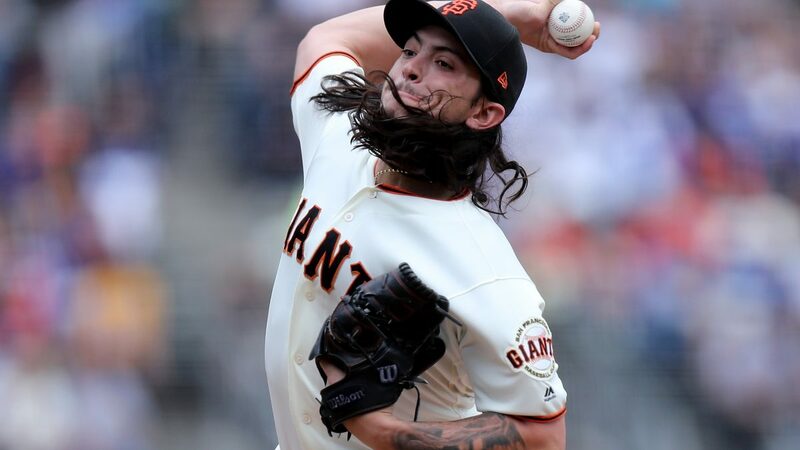 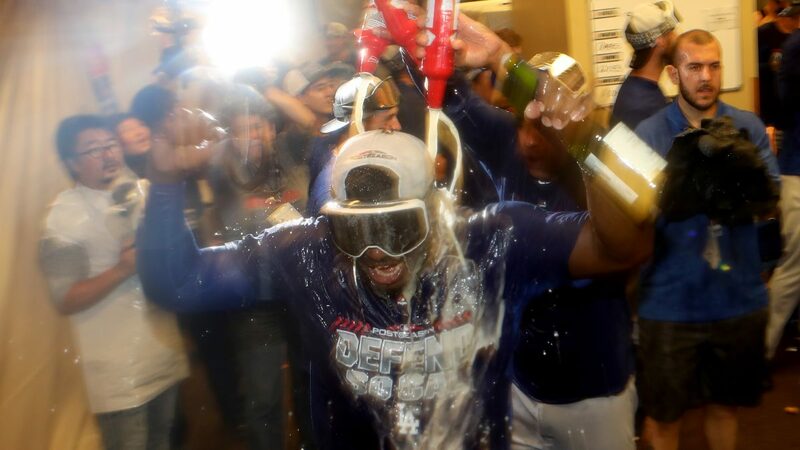 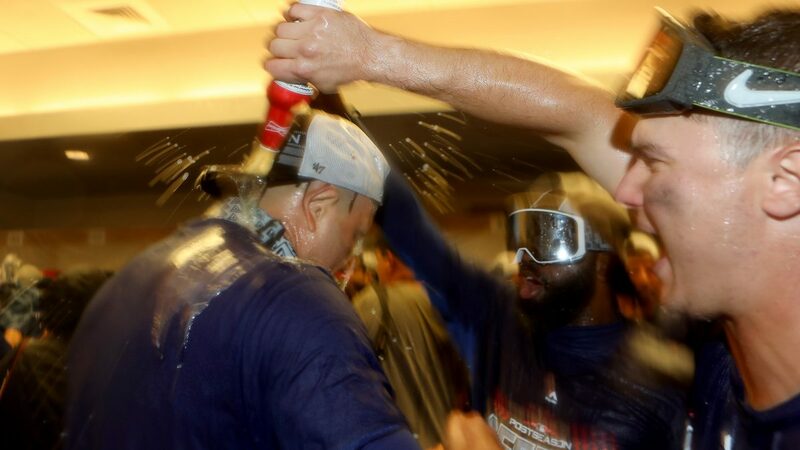 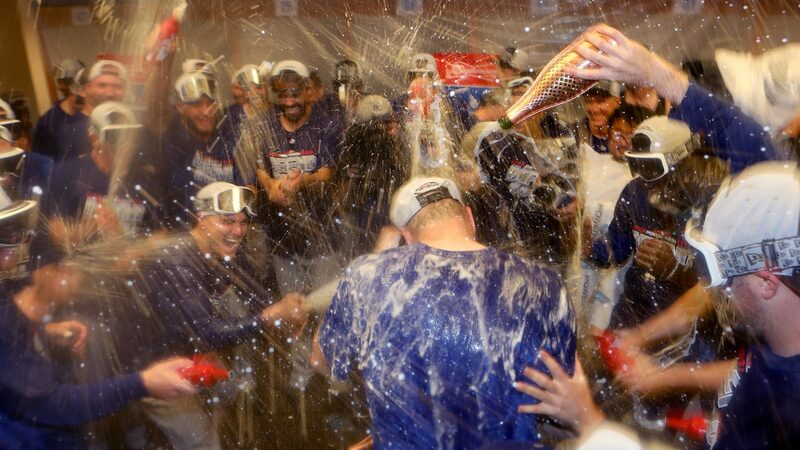 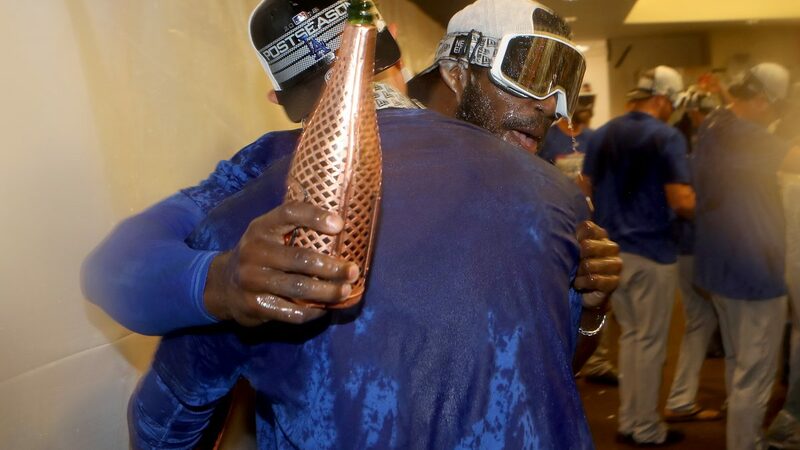 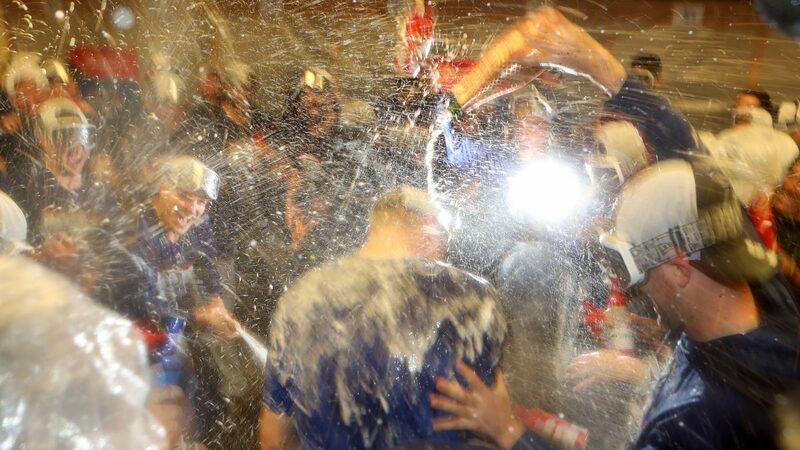 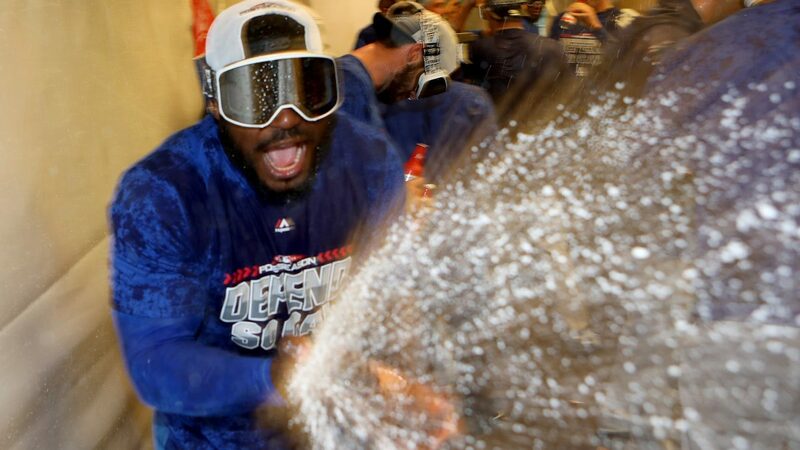 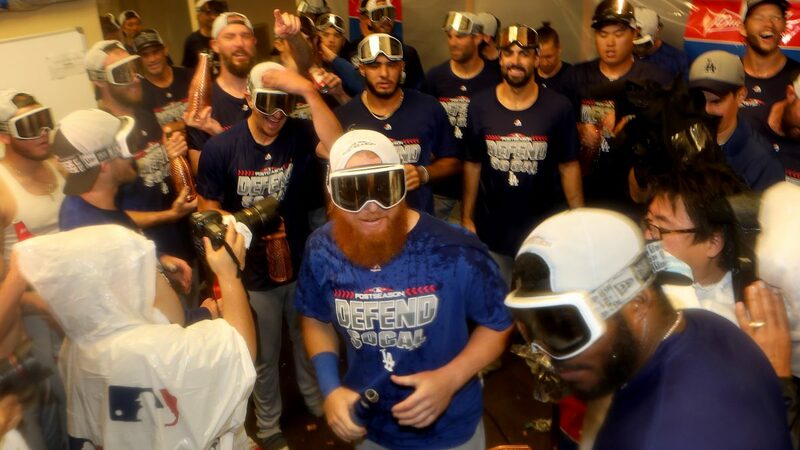 Andy Suárez (7-12, 4.22 ERA) will toe the rubber against Dodgers righty Walker Buehler (7-5, 2.76 ERA) in the season finale as the Giants hold onto hope that even as the champagne soaks into the upholstery of the visiting clubhouse, they can block Los Angeles from winning the West for the first time in five years as the Dodgers continue to trail Colorado by one game. 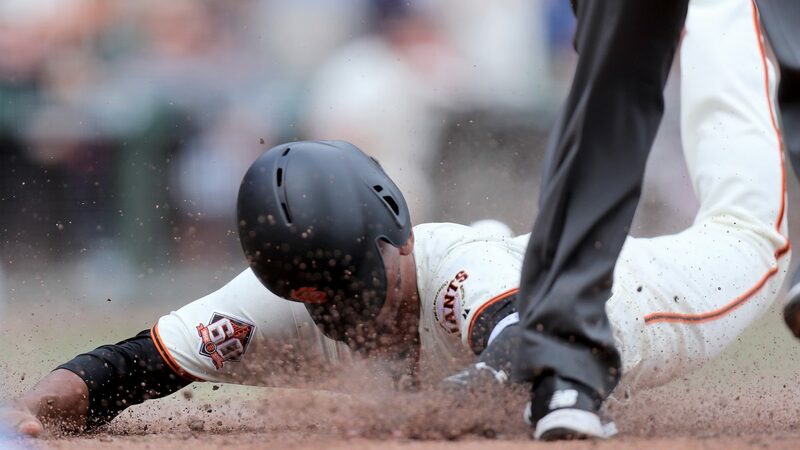 Austin Slater left Friday’s game in the fifth inning with a strained right elbow after a throw to the plate from left field. 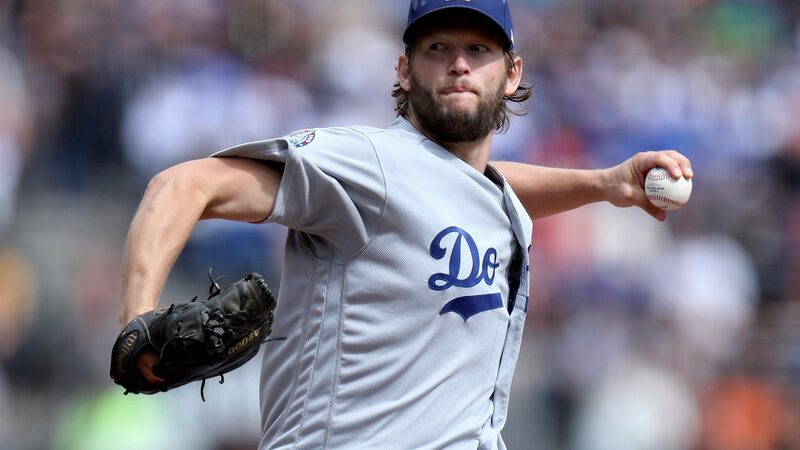 Saturday he underwent an MRI and was examined by team doctors. 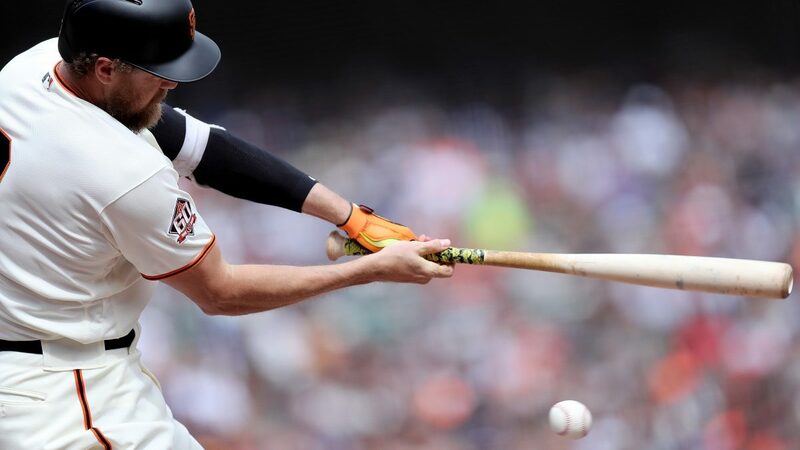 According to Bochy, Slater is done for 2018 with what he called an elbow strain with a mild sprain. 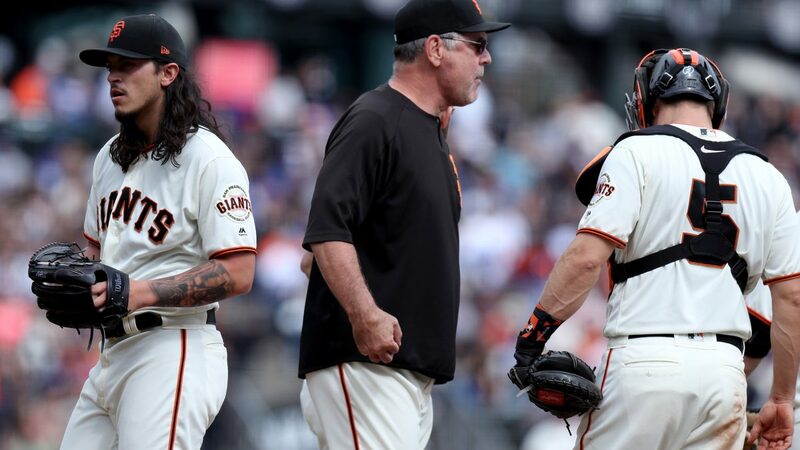 …The Giants designated goofball, Derek Holland, was seen wearing a leprechaun costume in San Francisco’s clubhouse Saturday morning after losing a bet to Jeff Samardzija earlier this month. 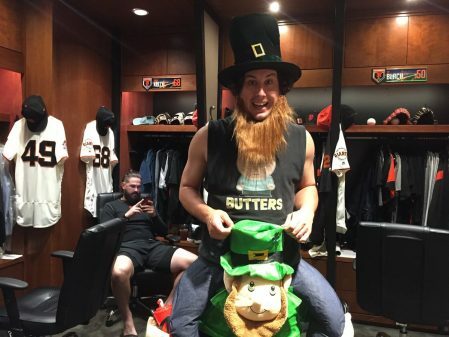 Derek Holland wears a Leprechaun costume after losing a college football bet to Jeff Samardzija in the Giants clubhouse at AT&T Park in San Francisco, Calif. on Saturday, September 29, 2018. 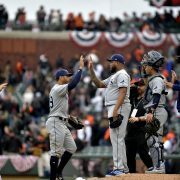 Holland’s favorite team the Michigan Wolverines fell to Samardzija’s Alma Mater the Notre Dame Fighting Irish, 24-17, on September 1.